This supplement can help you lose weight and lower high blood pressure, without raising your cholesterol. Learn more about the "green" alternative. A new study by the American Chemical Society found green coffee bean extract can significantly increase the rate of body fat loss in overweight people. Participants lost an average of 17.5 pounds in 22 weeks, equaling 10.5 percent of their body fat. It’s been a huge breakthrough for green coffee bean extract, putting it on the map for the first time in years. Green coffee bean extract has a high concentration of chlorogenic acid, which is a polyphenol important in plant metabolism. It seems to have the same effect on humans. The chlorogenic acid speeds up metabolism by slowing down the release of glucose from the liver into the blood. When glycogenolysis slows down, the body uses fat cells for energy instead of sugar. Burning up these fat cells can cause weight loss. Coffee is made from the seeds of the robusta plant which grows on trees. The seeds have 50 percent more phenolic acids than the fruit itself. Once the fruit is harvested, the flesh is removed, leaving the seeds to be roasted for coffee production. 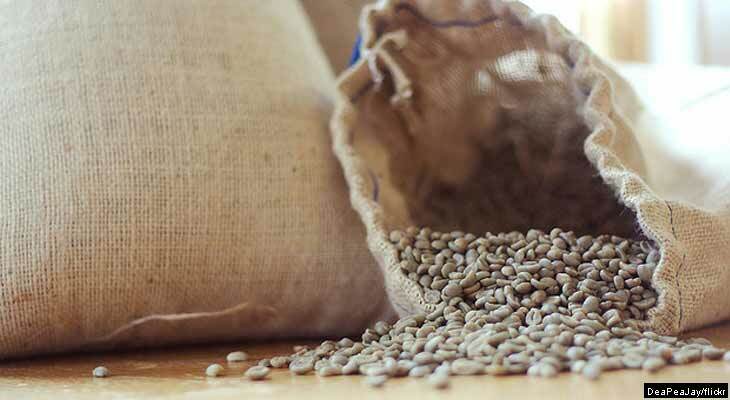 Green coffee beans come from the arabica plant. By not roasting them, their high levels of chlorogenic and caffeic acids remain intact, hence the “green.” These beans aren't boiled either, which lowers the amount of cafestol present. Cafestol is a compound present in coffee that can increases levels of "bad" (LDL) cholesterol. French press coffee and espresso contain the highest amounts of cafestol, while it is removed with filters in other brewing processes. On the March 22 episode of "Dr. Oz," Dr. Mehmet Oz recommended green coffee bean extract as an effective antihypertensive supplement for individuals who are currently taking medication for high blood pressure and are looking for a natural alternative. A 2006 study conducted by Health Care Products Laboratories Kao Corporation in Tokyo, Japan found green coffee bean extract significantly reduced high blood pressure in rats and humans. They credited the chlorogenic acid found in the extract for this change, which metabolizes nitric oxide. The vascular endothelium in individuals with high blood pressure produces nitric oxide in abnormal amounts which can be helped by taking green coffee bean extract. In a study led by U.S. Army Lt. Col. Dr. Stephen Harrison at Brooke Army Medical Center in Fort Sam Houston, Texas, researchers found coffee drinkers who consumed two cups of coffee or tea a day were less likely to suffer from liver damage as a result of consuming large amounts of alcohol. Many migraine medications contain caffeine to increase their effectiveness in reducing pain. Green coffee bean extract has the same caffeine benefits found in these medications and can enhance their effectiveness as well. Green coffee bean extract stabilizes blood glucose levels by inhibiting glucose-6-phosphate, an enzyme released from liver stores. By inhibiting this enzyme, the liver slows down the release of sugar into the blood. Green coffee bean extract has no reported side effects. Women who are pregnant or lactating should consult their doctor before taking green coffee bean extract. People who dislike the stimulant effects of coffee such as jitters or anxiety find green coffee bean extract as a viable alternative to drinking coffee. Source Naturals gives you 500 mg of this powerful extract. They use raw coffee beans that have not been roasted to create this product, which is an antioxidant naturally low in caffeine. This powerful formula fights free radicals while burning fat. CoffeeGenic helps your body burn more fat for energy to help you lose more weight. You don't even have to go on a drastic new diet! Each capsule delivers 400 mg of this powerful extract, which is rich in chlorogenic acid. Add a coffee kick to your weight loss regimen. All the green coffee extract you want and nothing you don't. taking this supplement before meals can help you burn more fat than diet and exercise alone, without any binders or fillers. Each capsule contains 800 mg of pure green coffee bean extract without any binders or fillers. You will achieve maximum fat loss with just two pills per day. Nutri Fusion's Green Coffee is a potent coffee supplement, containing 800 mg of the powerful extract in every serving. Each dose contains a standardized content of 50 percent polyphenols.